If you’re ever having a bad day, all you have to do to feel better is watch a few clips of baby goats. Their hopping, skipping, and joy for life is just so contagious. You can’t help but smile when watching all their crazy antics. For some reason, goats have such a huge love of climbing. This love, mixed with their naturally mischievous nature, will find them climbing just about anything. Goat farmers have found them on top of some of the strangest places – sheds, round hay bales, sides of brick or stone walls, on top of other animals, fences, and even in trees! A lot of farmers actually build climbing structures in their pastures in an attempt to keep them busy and out of trouble. Who knew horses could be such great babysitters? 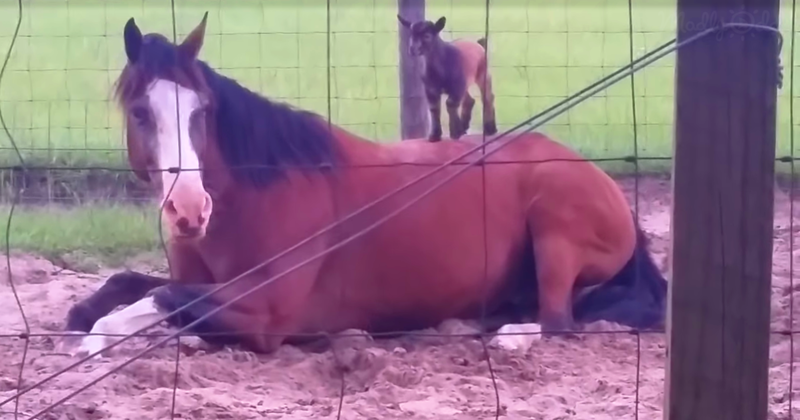 In this video, Mr. G lay in his horse pen, relaxing and napping. Suddenly, three baby goats appear and start playing and skipping around him. One brave little guy figures he wants to try to get to the top of the giant, breathing, brown “mountain.” He tries jumping, climbing, and falling off several times, but he doesn’t give up. He tries from this side, then from that side. Finally, he figures it out and makes it to the top. You can tell he is just so proud of himself – his tail is wagging, and he starts hopping in joy. He’s probably showing off to his two little friends down below. All the while, patient Mr. G holds still and allows the little guy to have his fun. Once the other two baby goats realize that their friend is having so much fun, they join in and try to climb Mr. G, too. The second goat quickly figures out how to climb on top of the patient horse’s back, and soon there’s two baby goats hopping and spinning on top of his back. The third baby goat is much smaller than the other two and sadly just never seemed able to figure out how to join his two buddies. Poor little guy! He tries to go under Mr. G instead of on top of him. Suddenly, the two lively goats decide they’ve had enough of the brown “mountain” and make impressive, flying leaps off of Mr. G’s back. All three little goats go skipping and hopping off, probably to see what else they can climb. If you thought these baby goats were hilarious, share this video with your friends to spread their contagious enthusiasm.